America faces a mounting transportation crisis, and the primary culprit is road congestion. Traffic makes us unhealthy, wastes enormous amounts of time, and cripples national productivity. America needs expanded roads and transportation infrastructure, but traditional gas tax funding is no longer available. An elegant solution is “congestion pricing”: allowing drivers to pay a fee to opt into express lanes where they can avoid traffic. Variably priced lanes generate the revenue necessary to build new roads by charging wealthy drivers, and reduce congestion across all lanes of a road. By our estimation, a new express lane on the I-10 in LA could earn well north of $100M / year, which could be deployed to construct 100 new lane miles of road a year or to expand other forms of public transit including ambitious tunnel projects. We estimate that congestion pricing at a national scale could earn America $10B — $20B a year, enabling busy people to fund badly needed infrastructure while saving them hundreds of millions of hours of time and increasing economic productivity. In total, Americans waste 7 billion hours a year sitting in traffic, at an estimated combined cost of over $160B. In fact, the cost is probably much higher. Hours wasted in traffic represent not only lost wages but enormous amounts of economic activity that might have happened. Congestion indirectly increases consumer prices, makes travel times unreliable for commuters and truckers, and precludes many people from accessing jobs in urban hubs. In this country, 50,000 fetal deaths a year are attributed to emissions, and each additional hour in a car per day correlates with a 6% increase in a person’s risk for obesity., Commuting consistently ranks the second highest expenditure for Americans, behind housing. Funding has not kept pace with demand for expanded lanes and well-maintained roadways. American roads are currently in terrible condition. The American Society of Civil Engineers ranks America’s roads a “D,” noting increased crash fatalities and an $836B backlog of highway and bridge capital needs. In California, for instance, 34% of major roads are in poor condition and 29% of bridges are operationally deficient. 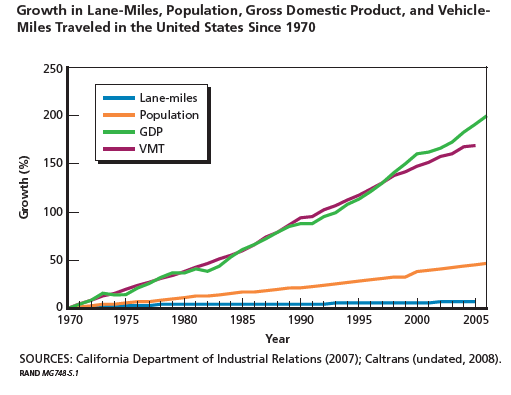 The construction of new lane-miles in the United States has stagnated since 1970, and rising vehicle miles traveled (VMT) have plunged our state and federal highway systems into disrepair. Some experts have identified a “fundamental law of road congestion” whereby traffic increases 1:1 for any expansion of road capacity. It is true that public roads are a heavy subsidy to motorists, who typically take advantage of any increase in supply. However unlimited demand for American roads may reflect a chronic under-supply of road capacity rather than a true law; in addition, population increases mean that congestion will worsen even more rapidly if new capacity is not built. Solving America’s transportation crisis will require investment in high-speed rail and other innovative forms of transportation infrastructure, but pouring concrete on new roads will be central to any successful strategy. Federal and state governments have traditionally used gas taxes to raise money for road maintenance and construction, neither the federal government nor most states adjust motor-fuel taxes for inflation. The federal tax per gallon of gasoline was fixed in 1993 at 18.4¢ and has not risen since — which means that in real terms, funding for federal highways is shrinking. Widespread adoption of increasingly fuel-efficient vehicles has compounded the problem. The Highway Trust Fund went bankrupt in 2008, and popular resistance to raising the gas tax have forced Congress to prop it up with general funds ever since. An elegant solution to the twin problems of traffic and inadequate road funding is “congestion pricing,” or charging drivers a toll to escape traffic. The market mechanism of congestion pricing allocates scarce roadway more efficiently than traditional roads by allowing travelers who value their time highly to pay for the luxury of speed. * Since wealthy motorists are more likely to pay to avoid traffic, congestion pricing also has the progressive effect of incentivizing those who can afford it to subsidize road maintenance and new lane construction. Congestion pricing is a Pareto improvement over standard lanes: travelers willing to pay benefit, and travelers in standard lanes experience unchanged or reduced congestion in the short term, and have the benefit of new and improved transportation infrastructure in the long term. The two most popular forms of congestion pricing are “cordon charges” on vehicles that enter a specific part of a city, and “variable lane pricing,” which dynamically tolls one or more lanes of traffic based on the average speed of vehicles on the road. Cordon charges have been huge successes in downtown Singapore, London, Stockholm, and Milan, but variable lane pricing is an even more promising solution to America’s transportation crisis. Variably priced lanes are straightforward to implement. Video cameras mounted on a gantry over an entire freeway measure the number of vehicles that pass per minute, and a computer program adjusts the price of the variably priced lane upwards or downwards based on the level of road congestion. The price of the lane is set high enough to maintain the free flow of vehicles (60–70 mph). The current price of the lane is broadcasted on a sign several hundred yards out from the entrance to the lane, and motorists decide whether to pay the toll. The video cameras record the license plates of vehicles that enter the toll lane. Drivers that have linked their license plates to a bank account and registered for the program in advance are charged the fee on the sign, and free-riders that have not linked their bank accounts are tracked down and fined (“video enforcement”). Vehicles in normal lanes are not charged. The details of variable lane pricing vary somewhat. “Express Lanes” charge a toll on all vehicles that enter, “High-Occupancy Toll Lanes” (HOT) exempt high-occupancy vehicles with multiple passengers. Both express lanes and HOT lanes exempt government vehicles such as public buses and ambulances. Lanes may shift prices infrequently — switching between two different prices for rush hours and off-peak hours is popular — or may be truly “variable” and change prices in response to traffic every few minutes. Local lanes may be administered by toll authorities or regional transportation planning agencies, which may be either state or municipal bodies. A route may include one or multiple tolled lanes, and could hypothetically charge different variable prices for different lanes. Today most variably priced lanes require drivers to purchase EZ-Tag or FasTrak “transponders” which communicate with antennae on gantries, however video cameras alone are sufficient to monitor drivers. This paper proposes that cities and states should seriously consider building variably priced lanes in high-congestion areas. In addition, Congress should make FAST Act road-construction funding at least partly contingent on implementation. Cities and states that deploy Highway Trust Fund grants to congestion price roads should be eligible for larger future grants. In addition, Congress should authorize the Department of Transportation to construct federally operated lanes on interstate highways. Characteristics may vary; the essential criterion is just that prices fluctuate to some degree in response to changing traffic conditions. The first congestion pricing systems in the US were pioneered in California in the 1990s. A 10-mile stretch of variably priced lanes on State Route 91 in Orange County continues to maintain average speeds of 60–65 mph even when speed in free lanes is as low as 15–20 mph. The success of the State Route 91 express lanes prompted many other states and municipalities to follow suit. Counterintuitively, building a new express lane or converting a general-purpose lane into a HOT lane decreases congestion in both tolled and non-tolled lanes — at least for a period of a few years. This was the case on SR 91, as well as in Minnesota, where MnPass HOT lanes increased user speeds by 25 mph, and non-user speeds by 3–4 mph., Drivers are demonstrating that they place an increasingly high premium on their time. 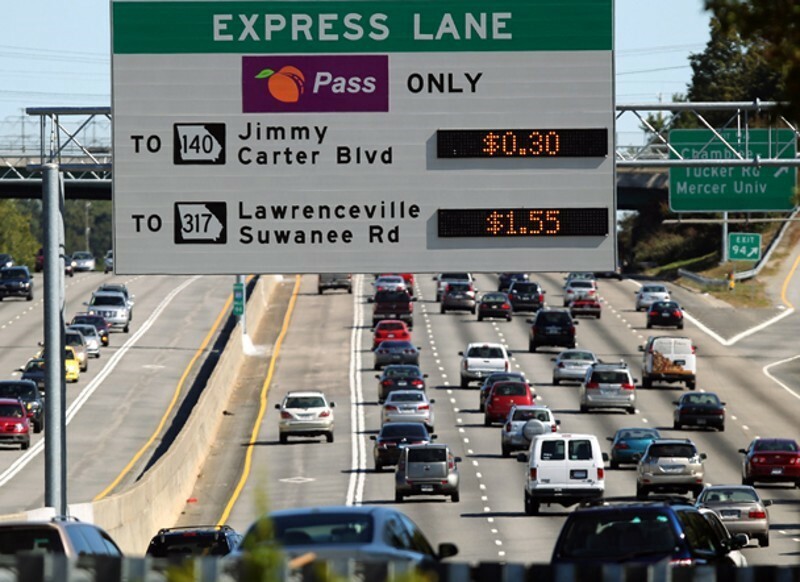 In Atlanta, home to one of the most successful express lane programs, the average number of daily trips on the I-85 grew from 7,300 in 2011 to nearly 29,000 in 2016 — even as the maximum toll price shifted from $5.55 in 2011 to $13.95 in 2016. The most obvious candidate for variable lane pricing is Los Angeles, which consistently ranks as the most congested city in the world. LA currently has HOT lanes in two locations: on I-10 from Alameda Street to the I-605 (14 miles), and on the I-110 from Exposition Blvd to 182nd street (11 miles). Together, these two toll lanes cost $210 million to construct, and they have been highly successful. Speeds in the I-10 express lane remain roughly 24 mph faster than normal lanes. However LA’s most congested roads remain un-tolled. A traveler on the 10 mile eastbound stretch of the I-10 from Exit 3A to Exit 12 in Los Angeles experiences on average 66 hours of delay a year. 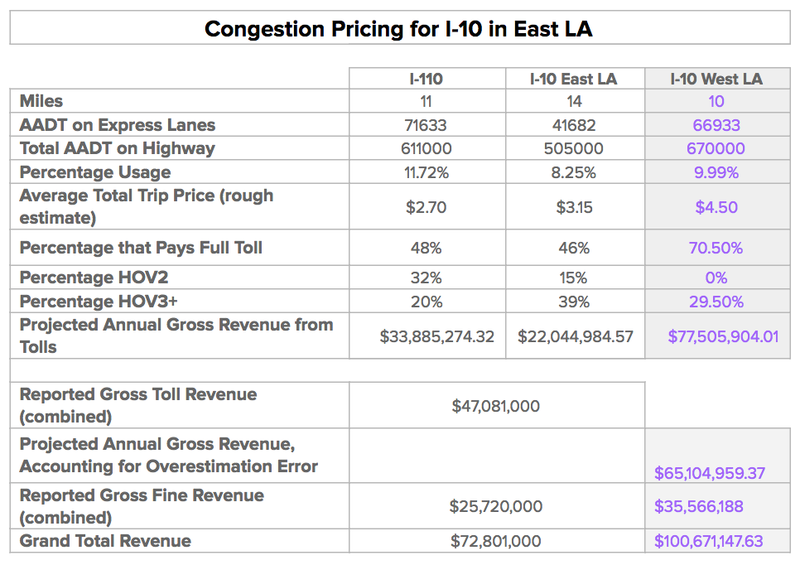 Drawing on data from LA’s two variably priced lanes, the table below models the potential revenue stream from an express lane along this route. LA’s Metro ExpressLanes charge low prices that do not reflect the premium drivers are willing to pay to escape traffic, and allow any vehicles occupied by two or more people to use the lanes for free. In our model, we assume that a new express lane from Santa Monica to downtown LA would charge an average of $4.50 per user, would only exempt cars with 3 or more occupants from the toll, and would impose fines proportionate to the fine-to-fee ratios of the other two lanes. Assuming that 10% of drivers on the given stretch of I-10 would opt into the lane (an average of usage rates on the other two lanes), this new tolling operation would generate over $100M/year. 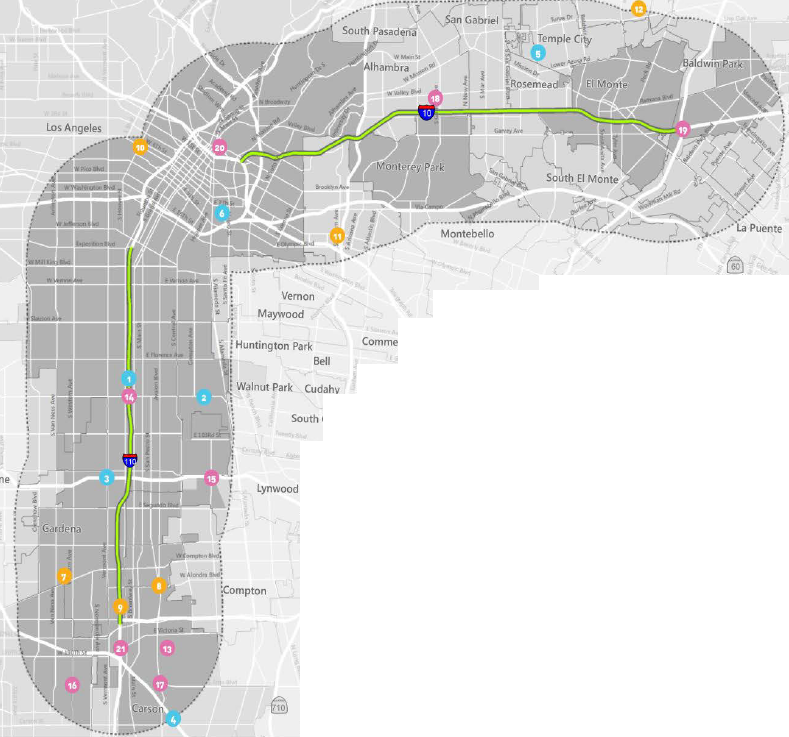 While it is impossible to determine time-savings in this model, LA drivers would save days of time on this one route alone. It would pay for itself almost immediately, and become an enormous source of revenue for LA County going forward. Two straightforward ways to deploy revenue are constructing new roads/lanes and building a network of transportation tunnels beneath LA. Milling and resurfacing roads costs $312,500 per lane mile and building new road costs between $1–2M per lane mile, which means that our proposed express lane alone could fund maintenance of 320 lane miles per year, or the construction of nearly 100 new lane miles of road per year. Tunneling costs vary widely depending on rock conditions, tunnel diameter, and density of support struts. Assuming difficult conditions, 1 mile of tunnel, 12 feet in diameter, would cost $11.6M/mile. The West LA express lane would fund 8.6 miles of tunnel construction per year. These are only two possibilities — in the future revenue from congestion pricing may be deployed to finance more exotic forms of transportation such as electric vertical-takeoff-and-landing (VTOL) and the hyperloop. The figures above are only a modest thought experiment. Ultimately, variable pricing should be a trial-and-error system that maximizes profit while ensuring that vehicles along an express way continue to flow freely. Administrators should A/B test rates to determine variance between locations, how swiftly to adjust prices, where to build new roads, and other items of interest. Price-signaling is not only the basic fabric of any free-market economy, it is a valuable source of administration for government officials. Traffic and road-pricing is no exception. Atlanta’s success in swiftly raising prices while simultaneously increasing demand is grounds for optimism that variable lane pricing may be a far greater source of revenue than projected in this paper. Establishing hundreds of express lanes and HOT lanes across the country will save people billions of hours and generate billions of dollars to fund the repair and expansion of the American road network and more. Although cordon charges have remained unpopular in American cities, variable lane pricing is politically feasible. 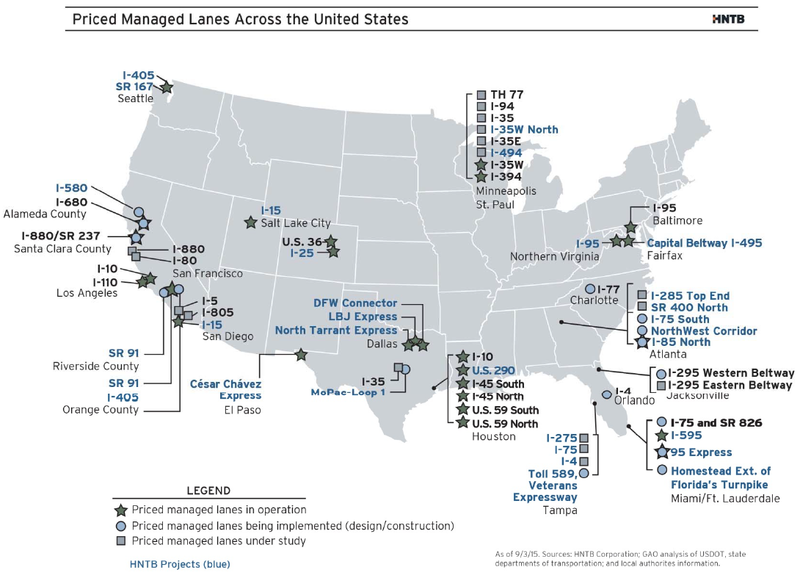 America has already implemented over 60 variably priced lanes accounting for around 600 lane-miles, and the majority of these were built in the last 5 years. In recent years, Uber and Lyft have also defended congestion pricing as the best strategy for fighting traffic and restoring America’s roads. Variably priced lanes are sometimes pejoratively described as “Lexus Lanes” — the vehicular equivalent of a VIP lines at nightclubs or accelerated lines at airports. But in fact, variably priced lanes are deeply progressive. Variable pricing naturally targets the wealthiest motorists, who will be most likely to pay a toll to avoid traffic. Cities may then use the revenue raised from these wealthy individuals to fund public transportation and construction of new non-priced lanes, decreasing congestion for the least well off. In addition, evidence from existing HOT lanes shows that drivers from all income groups value and make use of variably-priced lanes. Congestion is a significant drag on American GDP and an enduring source of misery for millions of Americans. Most Americans rank commuting as the most stressful part of their day, and it’s no stretch to say that traffic is one of the biggest barriers to the pursuit of happiness in our nation. Our roads are in poor shape, and the gas tax is no longer an effective way to maintain and expand them. Congestion pricing can heavily supplement the gas tax and generate revenue for the construction of new lanes. In the short-run, congestion pricing will eliminate congestion for those willing to pay; in the long-run, congestion pricing will mitigate congestion for all of us. America must rapidly implement variable lane pricing in thousands of locations across the country. *America’s roads represent a “tragedy of the commons” scenario in which the “commons” — roads — is susceptible to exploitative “overgrazing” — in this case, traffic. Roads are usually thought of as a matter of public provision. But it’s possible to imagine a counterfactual world where a “night-watchman state” enforces property rights but does not invest in infrastructure. 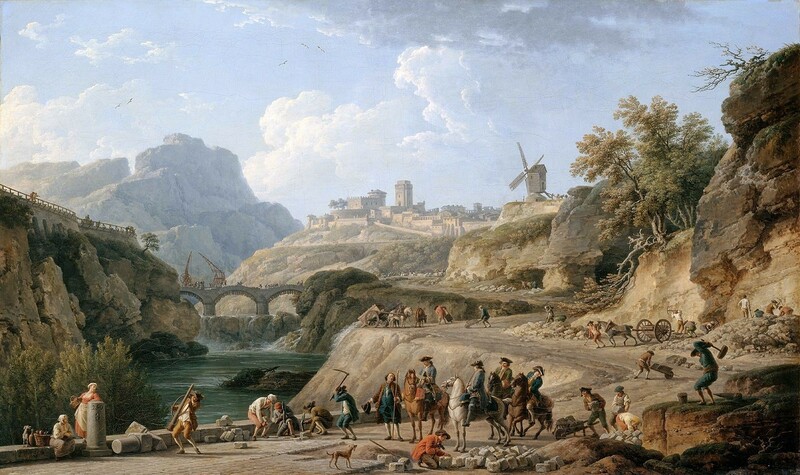 Road-construction in this world would entail a patchwork of bilateral or multilateral agreements between drivers who want to reach some destination, and land-owners whose property stands in the way of that destination. Each land-owner would be a kind of tiny, private toll authority. At a minimum, land-owners would charge rates necessary to maintain and expand the roads traversing their properties, but entrepreneurial land-owners would begin to vary the prices on different lanes to allow urgent drivers to pay more for lanes with higher rates of throughput. This is the basic idea of congestion pricing. Schrank, David et al. “2015 Urban Mobility Scorecard.” Texas A&M Transportation Institute and INRIX. August, 2015. Traffic-related car crashes alone cost $25B a year, see: Dutzik, Tony, Gideon Weissman, and Phineas Baxandall. “Who Pays for Roads?” USPirg, 2015. Caiazzo, Fabio et al. “Air Pollution and early deaths in the United States. Part 1: Quantifying the impact of major sectors in 2005.” Atmospheric Environment, 2013. Frank, Lawrence et al. “Obesity relationships with community design, physical activity, and time spent in cars.” American Journal of Preventive Medicine, 2004. Cummings, William. “5 Ways to Cut the Cost of your Commute.” USA Today, Dec. 4, 2017. ASCE. “2017 Infrastructure Report Card.” 2017. Khau, Jeff, et al. “Transitioning from the Gasoline Tax to a Fee on Vehicle Miles Traveled.” California Foundation for Commerce and Education, May 2014. Sorensen et al. “Moving Los Angeles: Short-Term Policy Options for Improving Transportation.” RAND, 2008. Duranton, Gilles and Matthew Turner. “The Fundamental Law of Road Congestion: Evidence from US Cities.” American Economic Review, 2011. “The Life and Death of the Highway Trust Fund.” Rockefeller Foundation, December 2014. The idea of congestion pricing was devised by Arthur Pigou in the 1920s (who was thinking about ‘carts’ rather than automobiles). Others include variable-rate curb pricing (for parking), and a VMT tax. “Using Pricing to Reduce Traffic Congestion.” Congressional Budget Office, March 2009. Mohring, Herbert. “Congestion” in Essays in Transportation Economics and Policy: A Handbook in Honor of John R. Meyer. Ed. Jose Gomez-Ibanez, Brookings Institution Press, 2001. Krol, Robert. “Tolling the Freeway: Congestion Pricing and the Economics of Managing Traffic.” Mercatus Research, 2016. “Congestion Pricing in the US” Virginia Department of Transportation, 2008. Beitsch, Rebecca. “Express Lanes Have a Popularity Problem.” Pew Charitable Trusts, September 12, 2016. INRIX Global Traffic Scorecard, 2017. “Future of Metro ExpressLanes.” Regular Board Meeting April 24,2014.
 http://vlhc.org/cna/hmm_appendix.pdf. Assumed Rock type C and Tunnel Drive “5th”, converted from meters à miles, and adjusted for inflation. Ungemah, David. “Express Lanes: A National Perspective on Practice, Experiences, and Outcomes.” December, 2016. Salzberg, Andrew. “Road Pricing: A Solution to Gridlock.” March 2017. Also John Zimmer and Logan Green, “The End of Traffic.” January 2017. Sorensen et al. “Moving Los Angeles: Short-Term Policy Options for Improving Transportation.” RAND, 2008. Summary, p.33. Gino, Francesca et al. “Reclaim Your Commute.” Harvard Business Review, 2017.